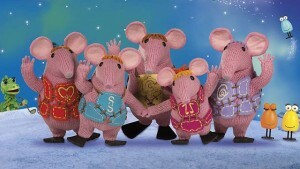 Clangers was a much-loved children’s TV series from the United Kingdom that originally ran from 1969 to 1974. It starred a set of little pink fuzzy creatures who most resemble elephants crossed with mice. They live on an alien world and speak only in swooping whistles — which were usually translated for the young audience by the narrator. Well now the BBC have brought back The Clangers for a much newer generation as part of Sprout, their programming line-up for children. Just like the old version, the new Clangers is created through stop-motion animation of actual fuzzy figures, and now the new episodes are narrated by Michael Palin (of Monty Python) in the UK and none other than William Shatner (!) for release in North America. Sprout has a special web site just for The Clangers so take a look to find out more.